Conveniently located just five minutes from the Greater Cincinnati Airport and only fifteen minutes from downtown Cincinnati, Traditions Golf Club is perfect for a round of golf after work, or anytime you desire. 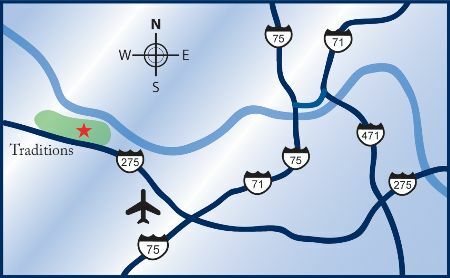 Follow I-275 West to Exit 8A, KY 237 North. Travel north on KY 237. At first light, turn left on Worldwide Blvd. Follow Worldwide 1 mile thru industrial park, to Graves Road. Turn left on Graves and go 1/4 mile to a right on Williams Road. Follow Williams Rd. 1 mile. Traditions is on the left.